A half-dozen years ago, with the first movie that began this franchise, Liam Neeson seemed to have given new life to his career. At an age where he was a bit old to be a romantic hero, he suddenly showed great promise as an action hero; and the movie was fun. Now, after a series of bad scripts, he seems mostly to be on a downward spiral. Last year’s movies were uneven. “A Million Ways to Die in the West” and “A Walk Among the Tombstones” were disappointing; “Non-Stop” was worth watching. But now we have this mess. The beginning is slow and hokey; the ending is stretched out with subplots; the middle feels like we’ve been here before. It’s ponderous, predictable, preposterous. It’s a waste of time, talent, and ammunition. It’s time for Neeson to look for better scripts; the one he’s working with here is lazy. But, once again, it’s about family. 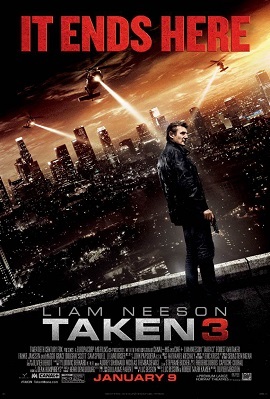 In “Taken,” his daughter was kidnapped; in “Taken 2,” both he and his wife were held hostage. What’s left? Well, here, his wife is killed – and he is blamed for the murder – and the real killers are coming for his daughter. So, there is a bit of everything we’ve seen before – and not enough of anything we’ve not. Part “The Fugitive,” part “John Wick,” part so many better movies, this is a mix of car chases and corny dialog, slug fests and shoot outs, dimwitted detectives and a protective Dad — and a plot that is resolved partly on warm bagels. And warmed-over sentimental clap-trap. There’s no tension, no suspense, no originality. Director Olivier Megaton knows how to direct – and cut – action sequences in a way where he can convince us that impossible and implausible things can take place — and that’s important here because otherwise Neeson could not possibly get out of the situations he’s gotten himself into. This is not good filmmaking; it’s a franchise that started out with such promise and has now overstayed its welcome. The tagline for this movie is: “It ends here.” To which we can only add: Thankfully!